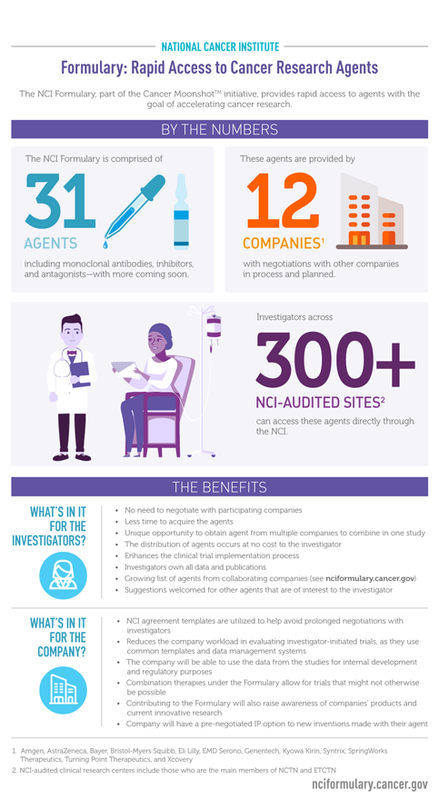 The National Cancer Institute (NCI) agent formulary (NCI Formulary) is a public-private partnership between the NCI and pharmaceutical and biotechnology companies that provides NCI funded main-member ETCTN and NCTN institutions and their investigators rapid access to agents for cancer clinical trial use or preclinical research. The NCI Formulary is particularly useful to investigators who would like to perform combination studies that focus on agents targeting molecular pathways from multiple collaborating pharmaceutical companies. A goal of the NCI Formulary is to improve the clinical trial implementation process for investigator-initiated trials by supporting an efficient mechanism to provide targeted agents to academic researchers. This effort requires pharmaceutical company collaborator involvement in an expedited clinical trial proposal review and approval process and a rapid protocol development and approval timeline. How Do Investigators Access Agents in the NCI Formulary? NCI funded main-member ETCTN and NCTN institution investigators submit a Letter of Intent (LOI) for clinical studies or a Non-Clinical Study Proposal Form to NCI’s Cancer Therapy Evaluation Program (CTEP). CTEP acts as a facilitator between the investigator and the pharmaceutical company collaborator. 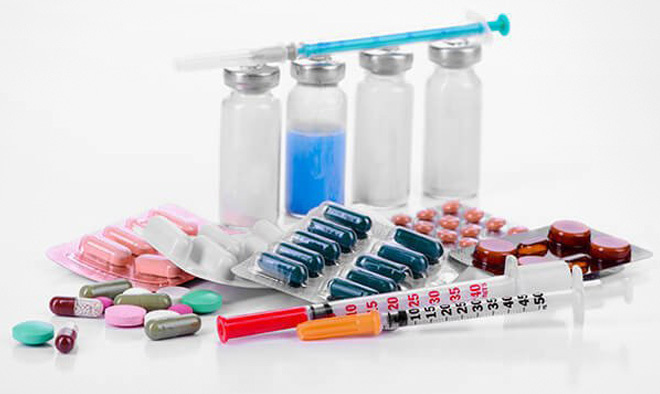 Pharmaceutical company collaborators provide scientific review of the proposals and clinical trial, agent for the clinical trial, and a letter of cross-reference to their Investigational New Drug (IND)/Drug Master File (DMF). CTEP does not provide scientific review of the NCI Formulary proposals. All scientific discussion is conducted between the pharmaceutical company collaborator and investigator. The LOI review process is limited to 60 days. The NCI uses its established clinical trial infrastructure to facilitate trial conduct of approved proposals. Review detailed Investigator Instructions, and submit a proposal.